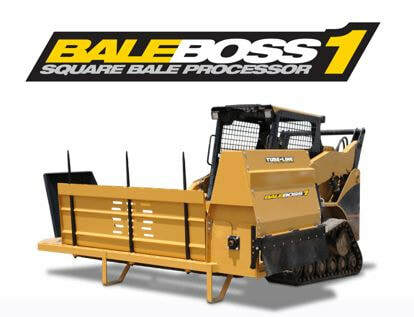 ​​Need to process square bales on your skid steer, tractor loader or telehandler? Whether you need to fit into tight spots where a trailed unit will not fit or you prefer to feed or bed from your skid steer, the Tubeline Boss 1 is a great addition to your farming operation. The Tubeline Boss 1 has a unique loader-mount design allows you to raise the BOSS 1 above gates and pens providing greater control of where the processed bale ends up. The versatility of a loader mounted unit makes operating it easier and more comfortable. Because the BOSS 1 is up front, loading bales is quick; simply Scoop n’ Go. The BOSS 1 is available in both 10 Series for straw, and the new 20 Series for straw and hay. The 20 Series provides better material management allowing tougher materials to flow through effortlessly whether you’re windrowing, bunk feeding or livestock bedding. Utilizing features such as the removable folding floor and retainer bars, you can rest easy knowing the new BOSS 1 20 series has you covered. ​Likewise, do you need to bed or feed square bales but want a trailed unit that is fully adjustable to fit anywhere from 3ft x 3ft bales to 4ft x 4ft bales, up to 9ft long monsters? Then the Tubeline Boss 2 is what you need! 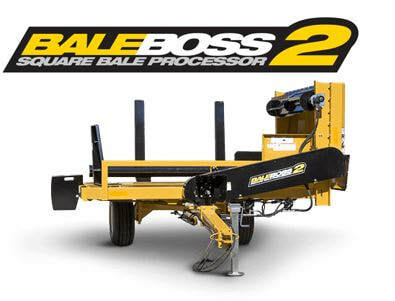 This is what Tubeline has to say about the Boss II square bale processor: The adjustable distribution chute allows the same machine to bed livestock with bales of straw then feed into bunkers or windrows with only a quick adjustment. The adjustments donӒt stop there. The BOSS 2 is also equipped with adjustable cutting knives that help to further chop up bedding material for a finer and more consistent spread. The hydraulic feed is also adjustable, allowing you to control the flow and speed of feeding. The flail roller is PTO-driven and adaptable to either 540 or 1000 RPM, while the upper paddle roller is hydraulically controlled and also fully adjustable. 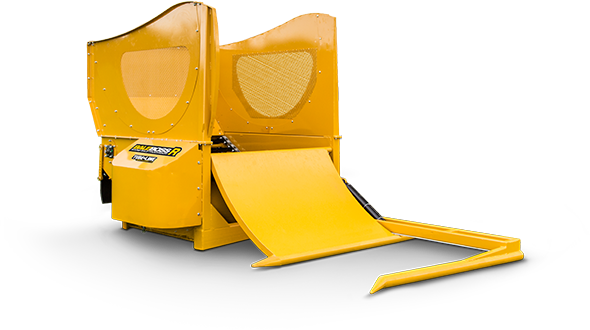 The hydraulic self-loading forks allow you to load one bale and have another standing by ready to go. The Bale BOSS 2 can be customized with an optional narrow wheel track making it ideal for spreading straw over delicate berry fields. This option also includes suitcase weights to balance the unit. ​A new model called the Tubeline Bale Boss R is available and it comes with the same great features as all the Boss models but is equipped for round bales up to 4’ wide x 6’ in diameter. The Bale Boss R picks up the round bales placing them onto the apron chain, the apron chain then grabs onto the bale turning it against the restrictor bars as the flail rotor pulls apart the bale. 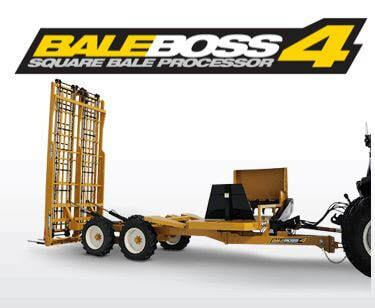 ​We also offer the Bale Boss 4 which can carry up to four 4’x4’x9’and the bales are easily loaded with the hydraulic self loading deck.